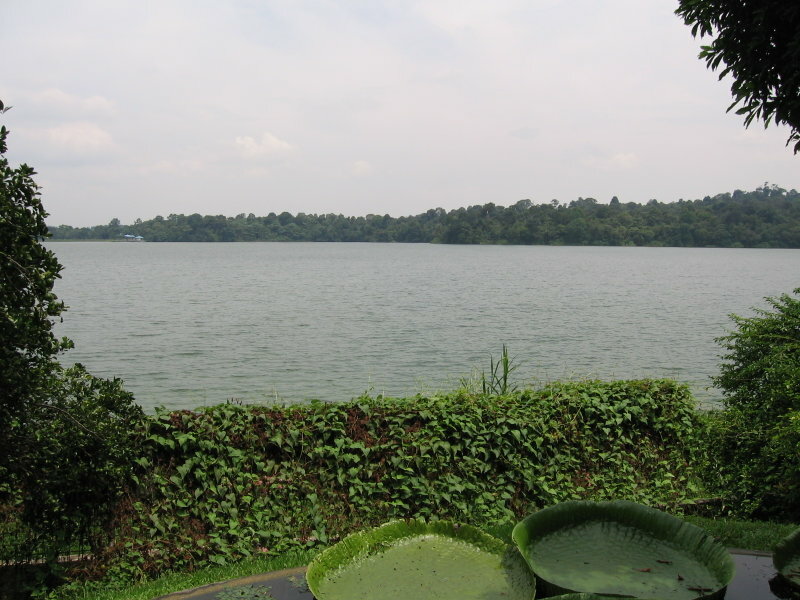 A dispute over the supply and price of freshwater between Malaysia and Singapore has been ongoing for several decades and may be exacerbated by the effects of projected global climate change. Singapore, heavily dependent on Malaysian freshwater, has previously threatened military action against the Malay government to forcibly take the resources. The conflict derives from several issues including the longstanding cultural rivalries between the two, the changing political situation, and the pricing of freshwater resources. Despite Malaysia’s plentiful water supply, industrialization, mismanagement, and climate change threaten to enflame the conflict. Singapore depends on Malaysia for nearly forty percent or more of its water supply. Therefore, the importance of securing a freshwater source is paramount to Singapore and the role of Malaysia as supplier frames relations between the two. The issue of supplying water to Singapore has, at times, been brought to the forefront of the Malaysian and Singapore political arena. This can be traced to as early as 1965, the year when Singapore was separated from Malaysia. Since then, Singapore has sometimes been the target of resentment from segments of the Malaysian society, especially when relations between these countries have become strained. For a variety of reasons within Malaysia including perception of Singapore’s inadequate consideration of religious sensitivities in Malaysia, the widening economic disparity between the two, and violations of territorial airspace, increased Malaysian incentives to threaten Singapore. The threat of cutting water supplies would often accompany such disagreements and tensions. For a comparison of Singapore to other ASEAN countries, see the chart below. Singapore is an island off the southern tip of Malaya (now known as peninsular Malaysia). The two regions share a common cultural history of several hundred years, but the modern political history dates to 1819 when the British Empire established a port in Singapore, then part of the larger British “Straits Settlements” in the East Indies (2). The port of Singapore became an important hub of British trade with India and China, which led to immigration from both areas. Over the course of the 19th Century, Chinese immigrants became the dominant ethnic group on the island, due in part to their success as trading middlemen. (3). In the post-WWII decolonization period, Singapore joined with Malay (and the British possessions on Borneo) to form the newly independent Federation of Malaysia. 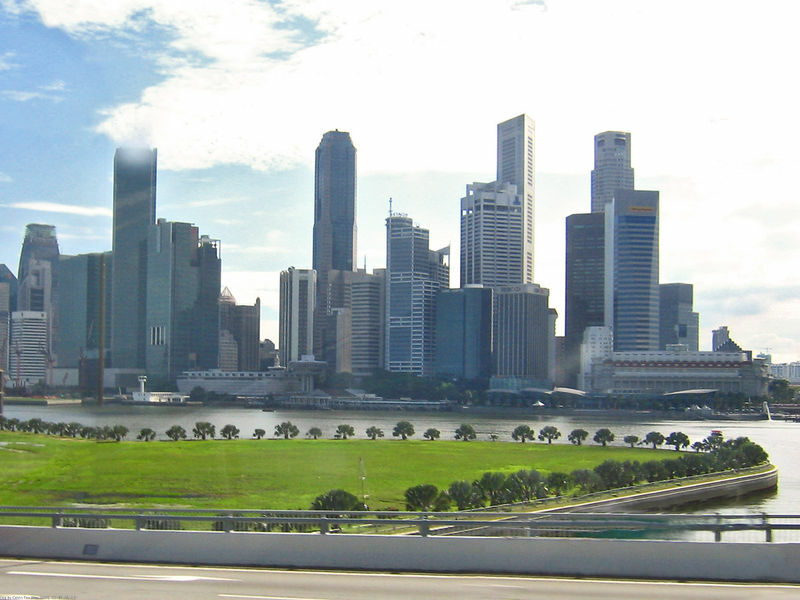 Immediately following the war, Singapore was regarded by its own government as too small and lacking in resources to be a viable sovereign nation. (4). The Malay government was initially hesitant, but agreed to the concept for fear of Chinese communists setting up a “Cuba across the causeway” (5). In 1963, the Federation came into being. However, ethnic conflict between Malays and Chinese undid the Federation in 1965, with the expulsion of Singapore. In the aftermath of the expulsion, Singapore invested heavily in developing a national identity and strengthening the security of the new state. Prior to unification with Malay in 1961 and 1962, the then self-governing colony of Singapore signed agreements with the territorial government in Johor, across the strait on the peninsula, regarding the sale of water. These “Water Agreements” have largely been observed since. 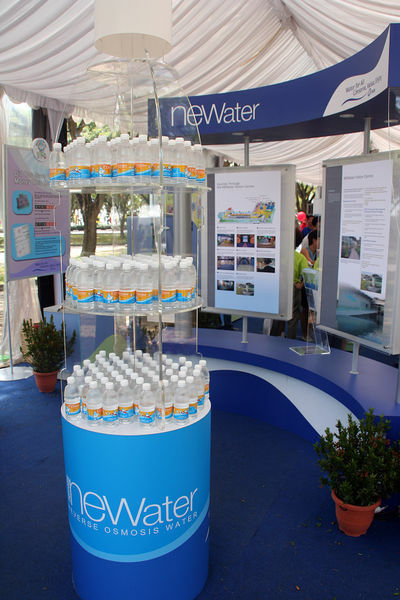 Presently, the major consumers of water in Singapore are the domestic and commerce/industry sectors. See the chart below for detailed consumption information. Fifty three percent of total water supply was used up by the domestic sector, and forty three percent by the commerce and industrial sector. The per capita domestic consumption has been falling gradually in recent years. Between 2002 and 2004, consumption per head fell from 165 liters per day to 162 liters per day (7). Water shortages and price hikes are likely to have greater impacts on the economy and the well being of Singapore’s population, thus having both economic and political implications on the state machinery. Recent technological developments have changed the course of the conflict. Singapore’s water deficit spurred breakthroughs and investment in multiple water procurement techniques. Singapore has adopted a “Four Taps Strategy,” where it sources water from its own reservoirs, from Johore in Malaysia, recycling (NEWater), and desalination. Singapore has indicated that as a result of its strategy, it will not pursue a renewal of the water agreement with Malaysia that expires in 2011 (8). August 9, 1965 (Singapore's independence from Malaysia) until recent developments. Malaysia is located in the South China Sea on the Malay peninsula and on the island of Borneo. 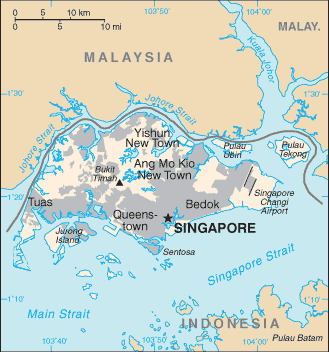 Singapore is an island city-state off the coast of peninsular Malaysia. Presently, around 680,000 m3 (or 149.58 million gallons) of Singapore’s water consumption is sourced from catchment areas around the city state. This represents about 60% of the country’s daily needs. 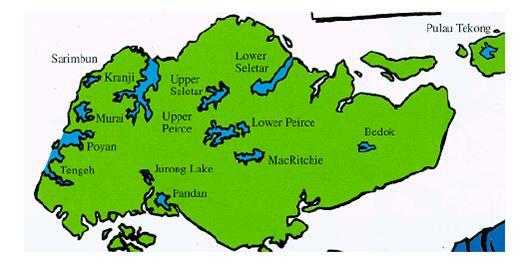 (9) As of 2005, there are fourteen raw water reservoirs in Singapore (see map). This problem is an access to water dispute, which may be compounded by global warming. Malaysia has, in the past, used the threat of cutting off water supply to Singapore, which relies on Malaysia for 40% of its water. 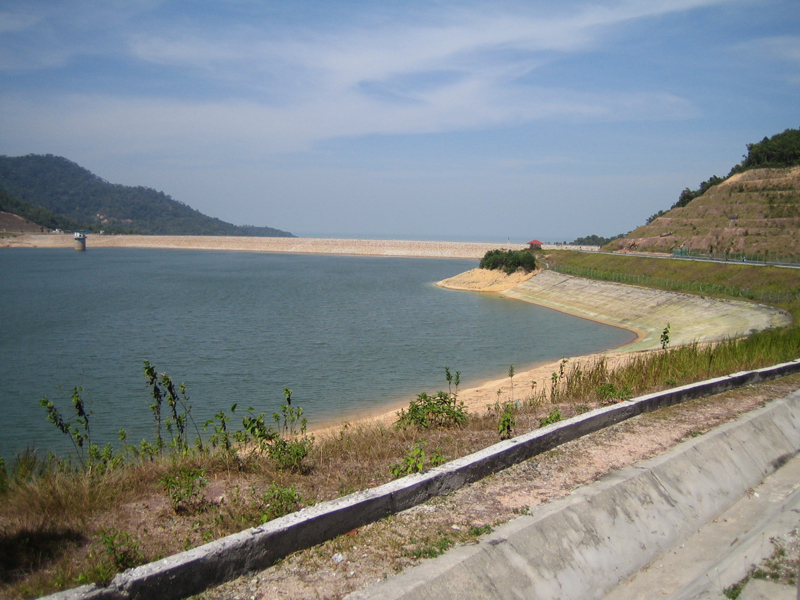 While agreements have been made regarding the supply of water to Singapore, these may be broken if freshwater supply in Malaysia is depleted due to global warming. Military repercussions cannot be ruled out in the event of a sudden disruption of water supplies from Malaysia, but this threatening situation may be exaggerated. It is important to note that the Malaysian government has never actually cut off water supplies to Singapore, in spite of the political sparring which has occurred since separation. In addition, there have been repeated assurances from the Malaysian authorities that Malaysia intends to observe the 1961 and 1962 water agreements made with Singapore up to 2011 and 2061 respectively (12). Singapore has adopted an ambitious plan to diversify its water sources, so as to minimize the influence of Malaysian water. Its “Four National Taps” program includes purchased water from Malaysia, treated wastewater (used mostly for industry), NEWater (advanced treatment of wastewater for human use), and desalinization. Moreover, Singapore has developed a new relationship with the province of Riau in Indonesia to import water via undersea pipeline. (See table for detailed statistics). The most relevant cases are most likely to be oriented toward the control of the fresh water resources of a river, namely the Litani, Tigris, Danube, Nile, and the Jordan. Many of the cases involve one upstream party (Turkey, Slovakia, etc.) diverting or threatening a party downstream (Syria, Hungaria, etc.). The majority of the cases presented here indicate that the downstream party has a claim to the water resources via territorial integrity over a river or body of water. The Russia-Latvia dispute over oil resources is the most similar to the Singapore-Malaysia dispute. Singapore has no other reasonable access to the given resource, as in Latvia, without the resource-rich neighbor, Malaysia and Russia respectively. Another striking comparison is between the ethnic dimensions of each of the cases. Most of the similar ICE cases involve one ethnic group withholding resources from another ethnic group based on political and cultural considerations. Hill, Ronald. Southeast Asia: People, Land and Economy. Allen and Unwin: Australia, 2002. Huxley, T. “Defending the Lion City: The Armed Forces of Singapore.” Allen and Unwin: Australia, 2000. Ling, Ooi Giok. Sustainability and Cities: Conflict and Assessment. Institute of Policy Studies: Singapore, 2005. pp 80. Morgan, Bronwen. “Emerging Global Water Welfarism.” In Consuming Cultures, Global Perspectives. Eds. Brewer, John and Trentmann, Frank. Berg: New York, 2006. pp. 279-310. Schwabach, Aaron. International Environmental Disputes: A Reference Handbook. ABC-CLIO, Inc: Santa Barbara, CA, 2006. pp88. UN Economic and Social Commision for Asia and the Pacific. “Good practices on strategic planning and management of water resources in Asia and the Pacific.” Water Resources Series, no 85. 2005. pp 89-97, 243-256. UN World Water Development Report 2. 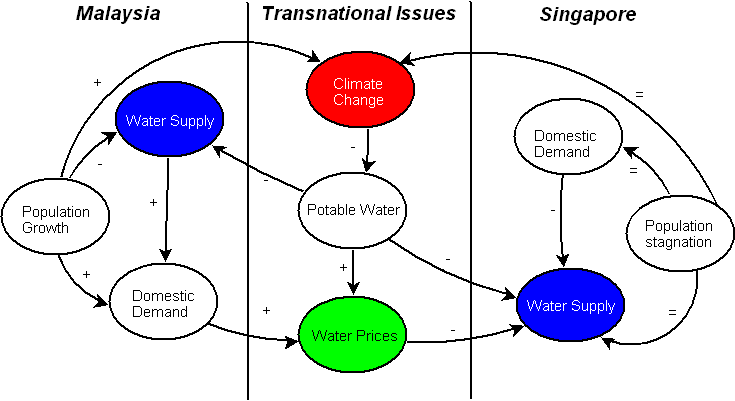 “Water: A Shared Responsibility.” 2006. Vincent, Jeffrey R. and Rozali, Mohammed Ali. Environment and Development in a Resource-Rich Economy: Malaysia under the new economic policy. Harvard University Press: Cambridge, MA, 1997. pp 233-267. Zerner, Charles. Culture and a Question of Rights: Forests, Coasts, and Seas in Southeast Asia. Duke University Press: Durham, 2003. 1 World Resources 2005: The Wealth of the Poor – Managing Ecosystems to Fight Poverty. Washington, DC: World Resources Institute in Collaboration with United Nations Development Programme, United Nations Environment Programme, and World Bank, 2005; ASEAN Statistics <http://www.aseansec.org/13100.htm>; ASEAN Statistical Yearbook 2001 <http://www.aseansec.org/macroeconomic/yearbook.htm>. Cited in Lee, Poh Onn. 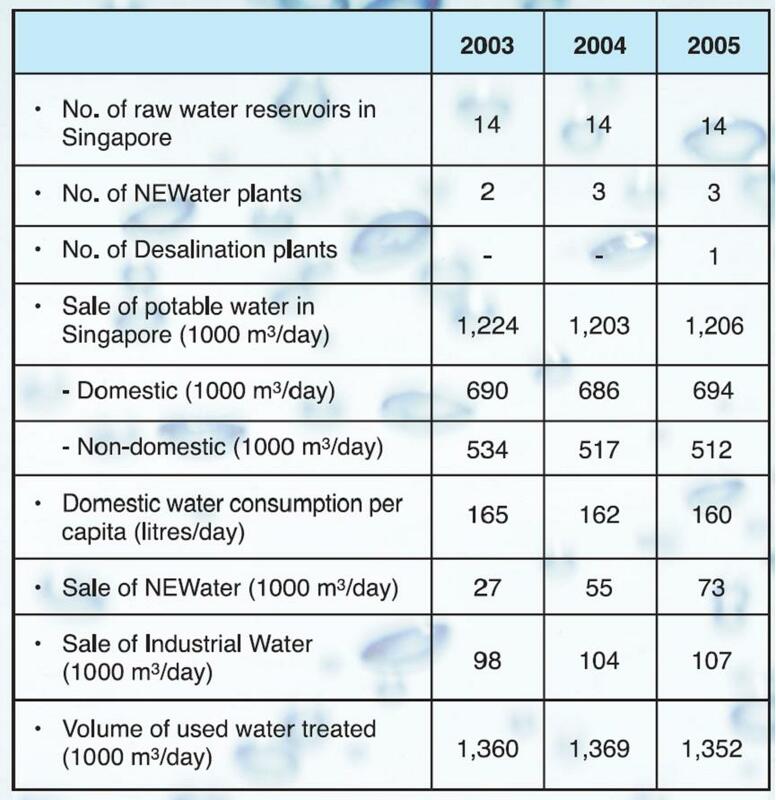 "Water Management Issues in Singapore." IIAS, 2005. Available online at http://www.khmerstudies.org/events/Water/Lee%20Nov%202005.pdf. 6 From Third World to First: The Singapore Story 1965-2000 (Singapore: The Straits Times Press and Times Media Pte Ltd, 2000), p. 276. Cited in Segal, Diane. "Singapore's Water Trade with Malaysia and Alternatives." Harvard, 2004. Available online at http://tbw.geo.orst.edu/publications/related_research/Segal-Singapore-Malaysia%2004.pdf. 7 Singapore Public Utilities Board (PUB). "2006 Annual Report and Vital Environmental Statistics." Available online at http://www.pub.gov.sg/home/Download_KES2006.aspx - http://www.pub.gov.sg/downloads/pdf/kes2006.pdf. 8 Singapore Ministry of Foreign Affairs. Press statement by Prime Minister Goh Chok Tong. 2003. Available online at http://internet-stg1.mfa.gov.sg/internet/press/water/SpeechPM.htm. 9 Singapore Public Utilities Board (PUB). "2006 Annual Report and Vital Environmental Statistics." Available online at http://www.pub.gov.sg/home/Download_KES2006.aspx - http://www.pub.gov.sg/downloads/pdf/kes2006.pdf. 11 Singapore Public Utilities Board (PUB). "2006 Annual Report and Vital Environmental Statistics." Available online at http://www.pub.gov.sg/home/Download_KES2006.aspx - http://www.pub.gov.sg/downloads/pdf/kes2006.pdf.